It’s certainly the beautiful covers of Time Magazine, especially in the 1930’s through the early 1950’s, that makes it such an attractive choice for collectors, however it is the content that has made it the top selling news magazine for decades now. So while this page is accented by some of the beautiful covers issued by Time Magazine over the years, the meat of this text examines the history of Time, especially the early history, and how they became and stayed number one in the field. Time Magazine was the product of two young men studying journalism together and soon after using their academic connections to realize their goal of a magazine intended to better deliver news to the mass public. Henry R. Luce and Briton Hadden were rival editors while at Hotchkiss and served together on the Daily News at Yale. After World War I they separated and worked as reporters at different newspapers, but were soon reunited at the Baltimore News. This amazing coincidence led to a quick turnover in reporters at the Baltimore News because Luce and Hadden would leave after only three months to go to New York and work on their dream publication, a magazine called Facts. While both men would become disenchanted with the original title, the original idea remained the same: contemporary news magazines were a labor to read and thus the public remained uninformed. They saw The Literary Digest as their closest competitor and as an example of what was wrong with the news magazines. John Tebbel, in “The Magazine in America: 1741-1990” notes: “The Digest selected its subjects arbitrarily and treated them at length, quoting liberally from newspapers and other sources. Time, by contrast, would cover all the news, briefly and in its own organized way.” Luce and Hadden wanted to break the news down into categories with each category delivering short punchy news pieces that the busy consumer could quickly understand and absorb. As noted in the Tebbel quote above, the title of the prospective magazine was changed to “TIME”. They worked their old Yale connections to raise funds needed to start Time Magazine, settling on much less than what had been suggested to them by others in the publishing industry. Incorporation papers were filed on November 28, 1922, less than a year after they had left the Baltimore News! Time Inc. started out with seventy stockholders who held anywhere from one to eight hundred shares. The first issue was dated March 3, 1923 and featured Joseph G. “Uncle Joe” Cannon on the cover. It was 32 pages long including six pages of advertising plus the covers and followed Luce and Hadden’s original plan by boiling the news down to 22 departments. All articles were published anonymously from the beginning except for the literary column which was signed “J.F.” for John Farrar, who submitted his columns free of charge. Time had other notables such as Stephen Vincent Benet and Archibald MacLeish contributing regular columns in the beginning for as little as ten dollars per week. By the end of 1924 Time Magazine had a circulation of 70,000. Time Magazine still garners tons of free publicity each year when they name their Man of the Year (now Person of the Year). This innovation was begun on a slow news week late in 1927 when the first subject was Charles Lindbergh, whom Time had not put on the cover the week of his famed Trans-Atlantic flight. Other early notables included Gandhi (1930), Franklin D. Roosevelt (1932, 1934, 1941), Adolf Hitler (1938), Joseph Stalin (1939, 1942), Winston Churchill (1940, 1949). As that roll call indicates, Person of the Year isn’t always about being a great guy, however in recent years it hasn’t hurt: Rudolph Giuliani was chosen over Osama Bin Laden in 2001 in one of the more controversial choices in recent history. At any rate, Person of the Year is surely Time’s most anticipated issue each year. Briton Hadden died from a streptococcus infection in 1929 at age 31. While shocked by the loss of his partner, Luce moved forward and soon launched Fortune Magazine, which debuted at the height of the depression in 1930. After this Luce busied himself with the idea of a picture magazine, an innovation which he would realize with the debut of Life Magazine in 1936. 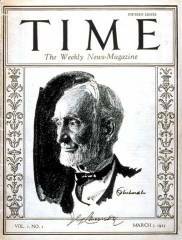 Time Magazine’s greatest rival, Newsweek first appeared with the issue dated February 17, 1933 (as News-Week). 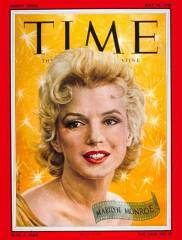 It was never a serious rival to Time’s status as the top news magazine during Luce’s lifetime, though it would briefly overtake Time during the Vietnam War largely because of the differing coverage offered by the two magazines. Time, always Republican in the mold of Luce and Hadden, treated the war from that perspective, while Newsweek became much more liberal after its purchase by Philip Graham in the 1960’s and covered the war from that slant. Further down the list of rivals was perennial number three, U.S. News & World Report, founded in 1933 as United States News and merging in 1948 with World Report. While not a direct rival, Luce sparred with Harold Ross, founder of The New Yorker. Time gave the very first issue of the upstart publication a poor review in 1925, while later on Ross would have Wolcott Gibbs write a mocking Profile of Luce when Life debuted. March 23, 1923: As mentioned earlier, the first issue. December 27.1926: The last issue with a white border around the cover. Cover features Alfred P. Sloan Jr.
September 26, 1938: The last issue featuring the latticed design at the left and right of the cover subject. This cover featured Richard Rodgers and Lorenz Hart. 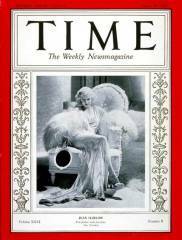 October 3, 1938: Followed by the first issue with the more modern looking “framed” border surrounding not only the cover subject but the Time Magazine logo as well. This cover featured William L. Bragg. March 21, 1960 issue when the solid white band inside the red border replaces the frame design for good. Caryl Chessman featured on this cover. I also noticed that beginning in early 1950’s Time would allow the cover subject to bleed into the logo area of the cover and that they would make this standard practice as time went on. I mention all of this mainly as trivia, however you may have noticed that what are usually the most collected covers fall between the 1928 and early 1950’s dates. During these years Time Magazine featured beautiful color illustrations of famed subjects on the covers, compared to previously using either black and white illustrations or photographs and often later using color photos or images that were not portraits. Luce died in 1967 and Time was taken over by Temple Industries, which held 15% of stock in the company. New people were brought in to run Time Magazine and helped to turn the mildly slumping publication around. Time Magazine is now part of the TimeWarner empire, publisher of 155 magazines worldwide. It all started when two young men were studying journalism together. Wallechinsky, David & Irving Wallace. History of Time Magazine. 8 Oct. 2005.